Cinema in the Prater amusement park, built 1905. Opened as "Kino Klein". 1924 renamed "Krystall Kino", later also known as "Kristall Kino". 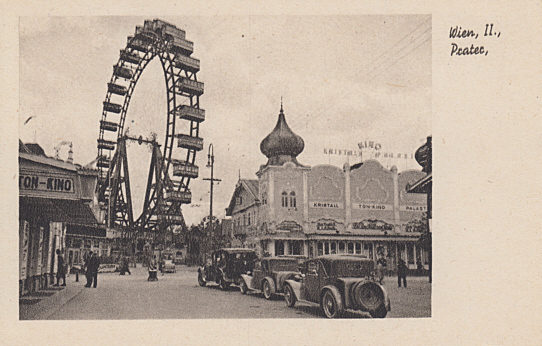 1933 renamed "Kristallpalast-Kino". 510 seats. Destroyed by bombs in 1945. The site is currently occupied by the "Prateruhr". 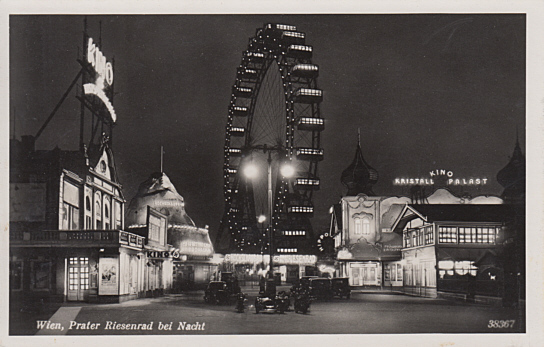 Front Text: "Wien, II., Prater", inscription on left building: "Ton-Kino", inscription above right building: Kino Kristall Palast", inscription on right building: "Kristall Ton-Kino Palast"
Front Text: "Wien, Prater Riesenrad bei Nacht", inscription above left building: "Kino [Lustspieltheater]", inscription above right building: "Kino Kristall Palast"
Reverse Text: "Riesenrad, 64 m hoch, 30 Wagen, 600 Personen fassend, erbaut von W. B Basset 1897"